GALA DE DANSE organisé par Serge Lifar au profit de NIJINSKY. et Le corps de ballet du Théatre National de l'Opera. Présentation des Artists par M. André de Fouquières. The orchestra under the direction of J.- E.Szyfer. Piano Graveau. Handsomely framed. Floated on background board, gilt filet, matted, glazed gilt-wood and gesso frame. 10 1/2 x 8 1/4" 26.7 x 21 cm.) 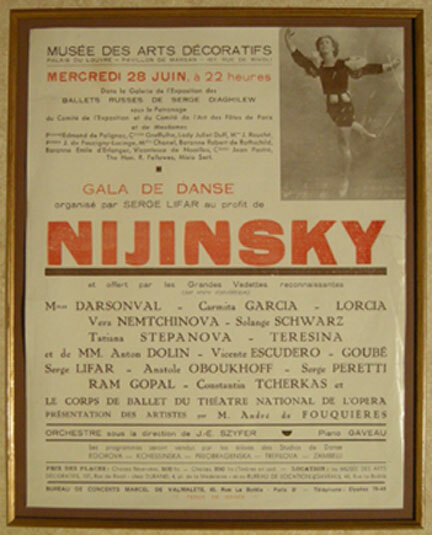 Frame: 16 1/2 x 14"
Nijinsky was a Russian ballet dancer and choreographer of Polish descent. Nijinsky was one of the most gifted male dancers in history. His ability to perform seemingly gravity-defying leaps was legendary. Nijinsky was born in Kiev, Ukraine, son of Polish dancers Tomasz Niżyński and Eleonora Bereda. In 1900, he joined the Imperial Ballet School, where he studied under Enrico Cecchetti, and Nicholas Legat. At only 18 years old he was given a string of leads. Nijinsky met Sergei Diaghilev, a celebrated and highly innovative producer of ballet and opera as well as art exhibitions, who concentrated on promoting Russian visual and musical art particularly in Paris. In 1909, Diaghilev took his dance company, the Ballets Russes, to Paris, with Nijinsky and Anna Pavola as the leads. The show was a huge success. The company was initially in resident at the Théâtre Mogador and Théâtre du Châtelet, in Paris where they returned in 1910 & 1911.